A cat in Illinois spent an entire week 30 feet off the ground in the branches of a tree. The feral Calico cat, named Becca, went without food and water during her stay, and wailed the entire time. The tree was located in front of a townhouse in North Riverside, a village west of Chicago. The animal had been in the same tree twice before, but this time she didn’t come down. Becca had been a neighborhood fixture for five years. Some neighbors suspect that the cat was pregnant, noting its unusually large belly. When neighbors called the fire department, they were told to wait — that the cat would eventually come down on its own. Tree service companies and the police said they could do nothing. A neighbor then called a weekly publication, the Landmark, which, in turn, made inquiries to the local police department. 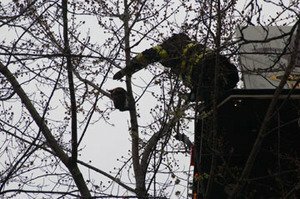 Soon afterward, a bucket truck arrived at the scene, and a firefighter attempted to extract the cat from the tree. The cat jumped from the would-be rescuer as he attempted to grab her, fell to the ground, and ran away, apparently unharmed.